Softwood: Where do we go from here? On March 15, 2018, Naomi Christensen, senior policy analyst, gave the following presentation to the Western Wood Truss Association of Alberta. You may have heard that last summer, the governments of Canada and the U.S. had a framework on a new softwood lumber agreement. It involved declining quotas – capping Canadian lumber exports to 30 per cent of U.S. market share and gradually reducing that down to about 27 per cent. The governments presented the deal to industry on both sides of the border, and it was promptly shot down by the U.S. lumber coalition. At that point in time, the U.S. preliminary duties on our softwood had been in place for a few months, but it would still be a few more months before a final determination was made and duties could be made permeant. It was the U.S. lumber industry that petitioned the U.S. Commerce Department to start the process of imposing duties, and they wanted to see that play out. Then in August, the NAFTA re-negotiation started. Because of the focus of both Canada and the U.S. on NAFTA, softwood negotiations have basically been put on hold. I do not expect to see any movement on a new deal until the NAFTA talks wrap up. U.S. duties currently average about 20 per cent for most companies. Five companies have their own specific duty rates: Canfor, Resolute, Tolko, West Fraser and J.D. Irving. Their duties range from less than ten per cent for J.D. Irving to 23.57 per cent for West Fraser. The duties are permanent, and under World Trade Organization rules, can remain in place for five years before the U.S. is obligated to review them. The last time the U.S. imposed duties on Canadian softwood lumber was in the early 2000s. The first ever softwood lumber agreement had just expired, and negotiations on a new deal were dragging out. The combined anti-dumping and countervailing duties averaged 27 per cent. In the five years the duties were in place (2001-2006), Canadian exporters paid $5.3 billion to the U.S. in duties. By 2004, almost six thousand sawmill layoffs were tied directly to the duties and sawmills were closing as a result. The federal government spent more than $330 million trying to help the workers and communities that were hardest hit. That economic pain is exactly what the U.S. industry meant to inflict. And that is what they banked on happening again this time around. But, thankfully, we are not seeing the same consequences today. In 2017, Canadian softwood exporters paid an estimated $500 million in U.S. duties. The Conference Board of Canada estimates that duties in 2018 will cost $1.8 billion. So, if duties are in place for as long as they were in the early 2000s – about 5 years – it could cost softwood exporters close to the same amount – around $5 billion. But we are not seeing the same effect. The duties paid last year were passed entirely on to U.S. consumers. · our dollar has remained lower than the U.S. dollar. · U.S. demand for our lumber is strong, as housing starts south of the border continue to rise. And we’re already seeing the effect of that in the U.S. – the National Association of Home Builders estimates that the price of single family homes will increase by more than $1,300 this year. That might not seem like a lot, but they have also figured out that for every $1,000 home prices increase, more than 150,000 families are priced out of being able to buy a home. The duties are also expected to result in the loss of more than 9,000 full time jobs in the U.S. and 400 million in tax revenue. A sure sign that the Canadian softwood sector is not yet feeling the pinch of the U.S. duties is that the federal government’s aid package for the sector has barely had any uptake from industry. In June 2017, Ottawa allocated $605 million for loans and loan guarantees to help offset the cost of the duties; only about 5 per cent of that has been requested. The big question is: why is there a such discrepancy between the impact of U.S. softwood duties in the early 2000s, and the minimal effect similar duties are having today? 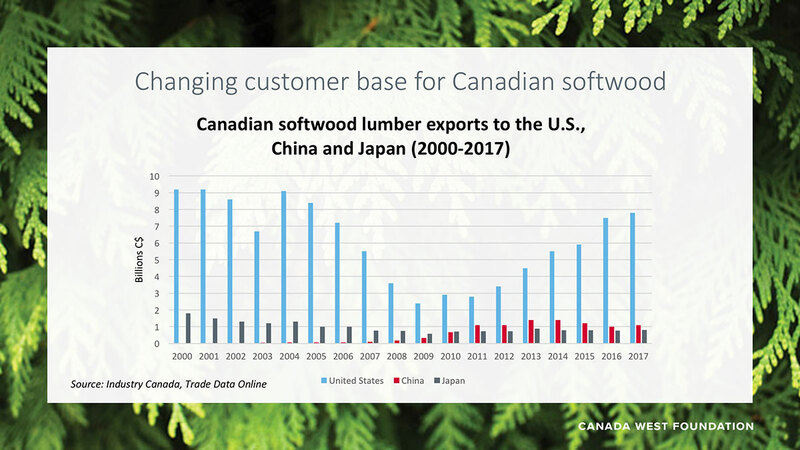 During the near decade the softwood lumber agreement was in place, many of the major factors that affect the softwood trading relationship between Canada and the U.S. changed. But these went largely unnoticed – particularly by the U.S.
I’m briefly going to go through how each of these changed, and how these changes contribute to the situation we are in today. 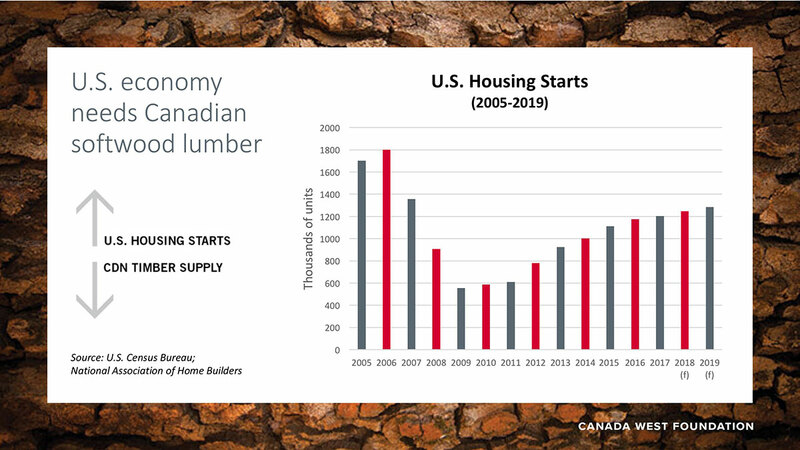 The combination of rising U.S. housing starts and declining Canadian timber supply is a major reason the softwood lumber agreement expired (SLA) with little fanfare in 2015. The U.S. economy needs Canadian softwood, and Canada is less of an economic threat to U.S. market share because our timber supply is declining. You can see in this graph that it was shortly after the softwood lumber agreement was signed in 2006 that U.S. housing starts started their decline. For most of the time the agreement was in place, housing starts were declining or stagnant. The upswing started around 2012, and it was only in 2014, the year before the SLA expired, that starts once again passed one million. Softwood lumber demand in the U.S. exceeds domestic supply – in 2016 the gap between domestic supply and demand was more than 14 billion board feet. Canadian softwood lumber fills the majority of that gap – last year, 96 per cent of U.S. softwood lumber imports came from Canada. Shortly after the softwood lumber agreement was implemented, Canada’s timber supply began declining. The red line on the graph indicates when the Agreement started. 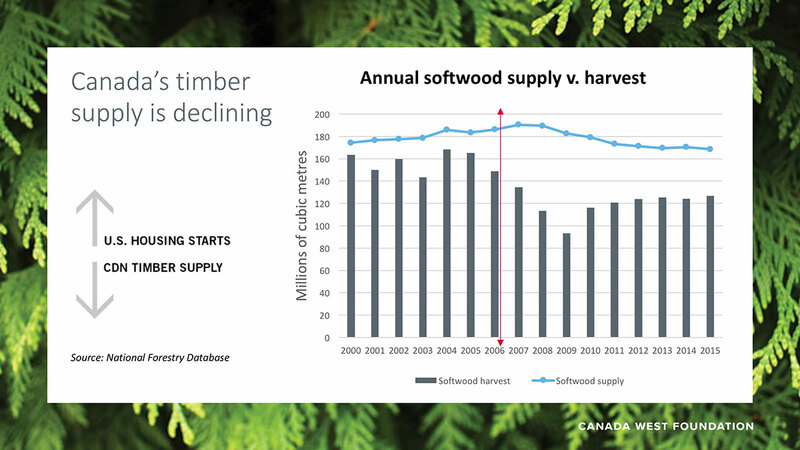 To the right of it, you can see the volume of both softwood supply and annual harvests are below historical levels. A couple things contribute to this. In Quebec, government conservation policy has decreased the volume of timber available for harvest. 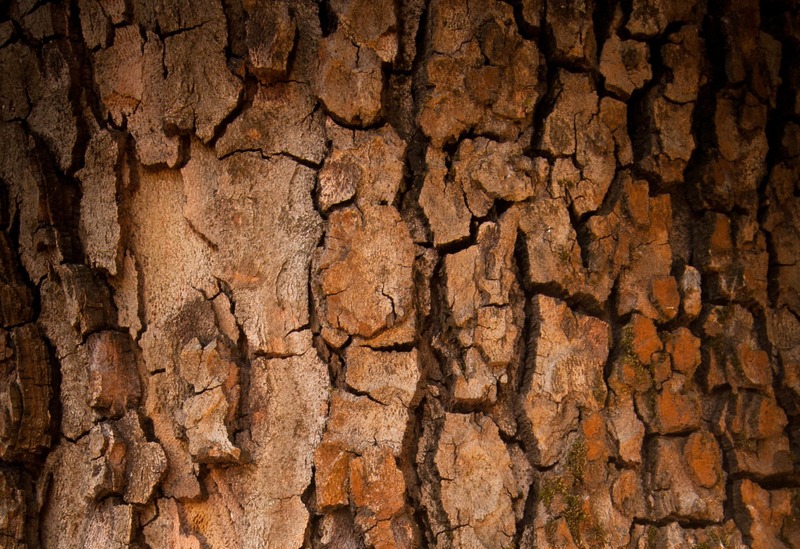 Here in the West, the mountain pine beetle is largely responsible for the decline. Even though the mountain pine beetle infestation peaked in B.C. in 2005, the effects on timber supply are going to last decades. Alberta’s annual timber harvest has been relatively steady since 2006, but B.C. is a different story – and it accounts for more than half of Canada’s softwood production. In the 1990s, the annual allowable cut in B.C. averaged 72 million cubic metres. It did increase after the pine beetle infestation, to salvage as much timber killed by the beetle as possible. B.C.’s forecast from now out until 2075 is that the ACC will be about 65 to 70 million cubic metres. Basically, 50 years from now, the average harvest will still be below the averages of the 1990s and 2000s. That is going to have a lasting impact on Canada’s softwood lumber production. This graph really tells the story of how decreasing timber supply will affect our ability to supply the U.S. market. The SLA capped Canada at occupying a maximum of 34 per cent of the U.S. market. Historically, Canada has held about 30 per cent. Canada didn’t even come close to the cap during the 9 years the SLA was in place – mainly because of decreasing U.S. demand related to the housing crisis and recession. In 2016, Canadian softwood occupied 32 per cent of U.S. market share – this makes sense as U.S. demand increased. 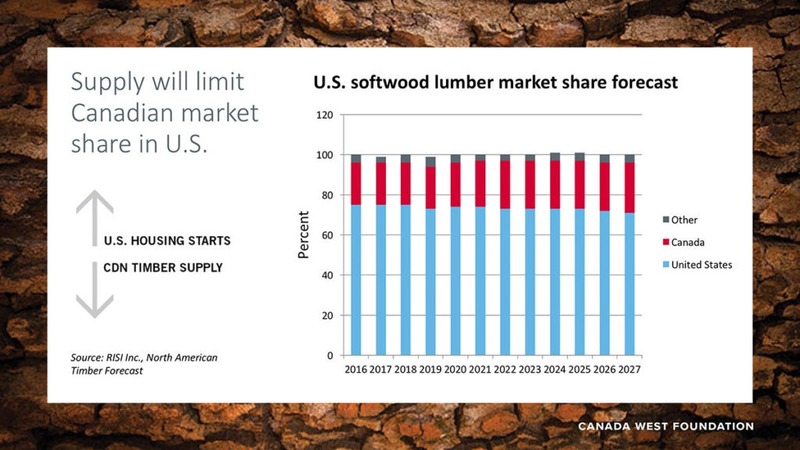 But 10 years from now, Canada is forecast to hold about 25% of the U.S. softwood lumber market. That’s almost 10 per cent less than the cap that was in the SLA. Even if Canada wanted to dramatically increase our exports to the U.S., we do not and will not have the physical capacity to do so. This really does make Canada less of a threat than ever to U.S. domestic softwood producers, but they have overlooked – or chosen to ignore – this. Probably the biggest thing that has escaped attention, particularly in the U.S., is the integration that is taking place in the North American lumber sector. Canada’s timber supply is a stark contrast to the U.S. south where there is excess supply. Canadian companies have been buying mills in the southern and western United States to make up for declining supply in Canada. In 2000, two U.S. mills were bought by a Canadian company. Today, three of the largest lumber companies in western Canada combined operate more sawmills in the U.S. than they do in Canada. In the big picture, Canadian companies are still a minor player in the U.S. Combined, they own about 5 per cent of the total number of mills. But, there is certainly a lot more integration now than there was a decade ago. In looking at public statements about Canadian acquisitions of U.S. mills, the stability of owning operations in the U.S., which would be unaffected by trade disputes, was clearly one of the drivers of these investment decisions. This strategy seems to be working – I mentioned three of western Canada’s largest companies combined operate more sawmills in the U.S. than they do in Canada. Two of these companies were singled out by the U.S. in the latest duties and have duty rates higher than the average. But, the majority of their operations are actually in the U.S. and are unaffected by the trade action. The chart here shows the yearly average of the framing lumber composite price. I use this measurement because it was the benchmark used under the last softwood lumber agreement to determine whether there would be an export charge on Canadian softwood exports. In 2017, the FLC price averaged $413 per thousand board feet. The last time the price was higher than this was 1997. In the first two months of this year, prices were even higher than they were in 2017. Continued strong demand from the U.S. housing sector is expected to keep prices high in 2018. 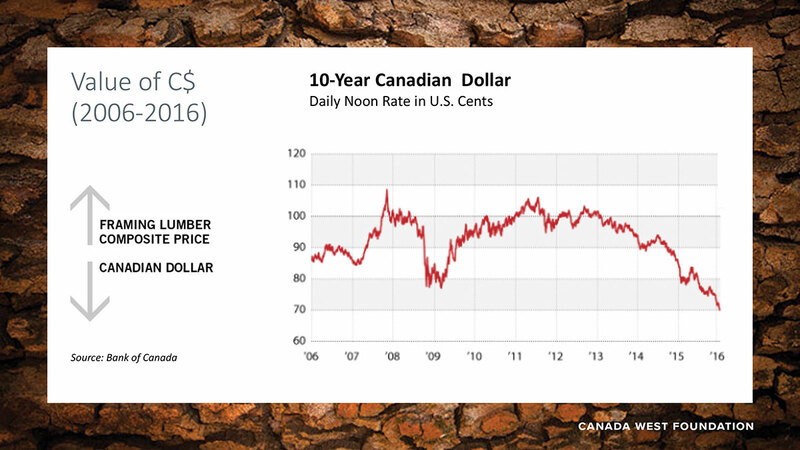 At the same time lumber prices have been rising, the value of the Canadian dollar has remained lower than the U.S. dollar. This chart shows how the value of our dollar changed while the SLA was in place. 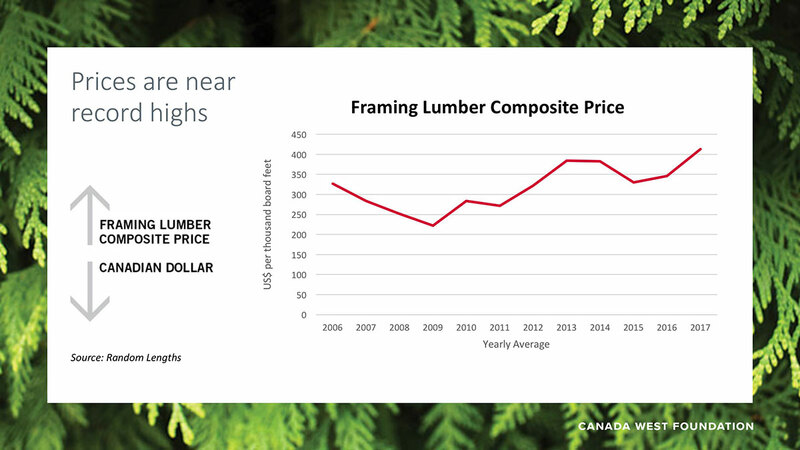 Canadian exporters are benefiting from high lumber prices combined with a low dollar – operating expenses are in Canadian dollars and revenue is earned in the higher American dollar. It’s a big reason revenues continue to rise for those lumber companies that have actually experienced a slight decrease in exports to the U.S. because of the duties. Unfortunately, when the U.S. lumber sector sees Canadians reaping a profit – even when it is due to something like the exchange rate – it further motivates them to pursue, or continue, trade action. While the U.S. continues to be our largest customer for softwood lumber, it was while the SLA was in place that we really broke into China. China is the red bar on this chart. In 2006 when the SLA was signed, China accounted for less than 1 per cent of Canadian softwood exports. Five years later, by 2011, 21 per cent of exports went to China, and B.C. was the leading global supplier of softwood lumber in China. Since 2011 exports to China have been lower and fairly stagnant – last year just over 10 per cent of softwood exports went to China. But even this scenario maintains a big shift made in Canada’s customer base. China is our second biggest buyer and exports to the U.S. are still below historical averages, making us less reliant on the U.S. even if just by a little bit. Japan is the other bar on this chart, in gray. We export a bit less softwood to them than we did in the early 2000s, but they are still a stable customer, consistently now our third largest. That paints a picture of where we are on softwood. Now where do we go from here? Canada has launched appeals of the U.S. duties to both a NAFTA dispute panel and the World Trade Organization. Last month’s federal budget included funding over 5 years [$191 million] to support this litigation. These processes do take time – at least a couple years. The good news is, that past appeals have all resulted in the U.S. having to lower their duties. As we appeal the U.S. duties, we also need get serious about further market diversification for our softwood products. It is really easy to run back into the arms of the U.S. when conditions are good – and that is what is happening right now. But in the long run, over-reliance on the U.S. market is what causes so many problems for our softwood exporters. We are not yet as serious about market diversification as we should be. It is great that we have broken into China and established it as a stable customer. But having just a few good customers is not enough. There are areas of the world that are hungry for softwood and we should be reaching out to those consumers. These include markets like the Philippines, Vietnam, Thailand and Indonesia that have booming furniture and packaging sectors. We should be looking at Mexico – the most accessible market to western Canada after the U.S., where the U.S. supplies the majority of softwood imports and we could take market share away from the Americans. Although timber supply is declining, we should still be pursing new customers. The best scenario for Canada is to be a preferred supplier with high demand in multiple markets. To wrap up my softwood comments, let’s go back to the early 2000s. Canada was taking a big hit from U.S. duties and things were pretty dire. There were mill closures and layoffs, and we needed a softwood lumber agreement to put an end to that and bring some certainty and predictability back to the market. This time around, things are not so dire. It is fair to ask if we really need another softwood lumber agreement. What is most likely to happen is that the NAFTA and WTO appeal processes will play out, taking a couple years. We can be fairly confident that Canada will prevail, as we have in past appeals. If the U.S. has to lower its duty rates as a result of the dispute panels rulings, and market conditions like lumber prices and demand from the U.S. remain favourable, Canada could be just fine operating in that environment without a new softwood lumber agreement.